The head of Russia's Federal Protection Service (FSO), responsible for protecting the life of the president, has been replaced. RBTH looks into what this change means and what this most mysterious of all Russian special services does today. The Federal Protection Service (FSO) is a powerful, multi-purpose and extremely secretive agency. There is hardly a more closed Russian security force – only assumptions can be made about its activities. There is no public data about its operations, there are no publicly available reports. For 16 years, it was headed by General Yevgeny Murov, a longtime ally of President Vladimir Putin, who, like the Russian leader, emerged from the Leningrad power structures of the late Soviet period. But on May 26, Putin accepted Murov's resignation and appointed his deputy, Muscovite Dmitry Kochnev, to the post. Murov's resignation is believed to be down to his age. He turned 70 last November, reaching the age limit for civil servants, and Russian media had long been predicting his imminent resignation. One of the country's most influential people, General Murov took up the position of FSO head 11 days after Putin became president and, so they say, has kept a tight hold on his position ever since. Very little is known about the new appointee. Kochnev is a man without a biography; there is not a word to be found about him on the Kremlin's and the FSO's websites. It is only known that he led the Presidential Security Service (part of the FSO) from the end of 2015, and that his wife, according to the income statement, earned 58.1 million rubles (about $830,000) in 2015 – more than any other employee in the department. The roots of the FSO go back to one of the directorates of the KGB – the Soviet-era state agency with very extensive powers. This directorate was responsible for the safety of top officials, just as the FSO is now. There are many legends about their mission to protect "body number one." For 15 years, rumors have circulated that FSO officers use a presidential body double for Putin’s riskiest performances – like submersible dives to the bottom of Lake Baikal or flying a fighter jet. Sometimes, the FSO officers are dressed in black suits with a microphone in the ear; sometimes, they wear civilian clothes and get lost in the crowd. Only the most trusted work there. Even so, they have been known to fall into temptation and post a work selfie on social networks – reporters have repeatedly stumbled on such photos, as well as on personal information about FSO guards. The FSO officers protect not only the president but also judges, witnesses, officials, and official sites such as the Kremlin and the State Duma. However, this is only one of their many tasks (and opportunities). Under General Murov, the FSO desperately fought for more powers and the status of Russia's main security service against its main rival – the FSB (Federal Security Service). And it seems to have won. 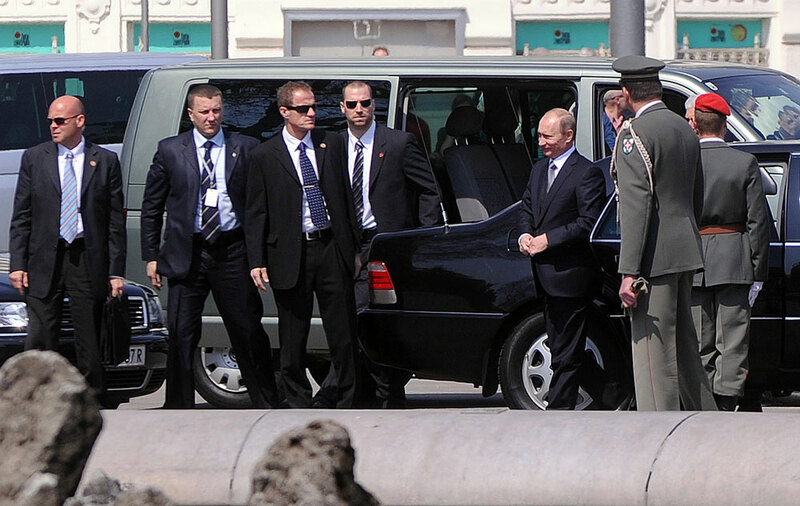 In the mid-2000s, the FSO, along with other special services, was involved in a tough confrontation within the power structures from the Russian president's inner circle. The infighting was not only for the proximity to "object number one," but also for the control of cash flows, assets and resources. QUIZ: Can you tell Vladimir Putin from his 'House of Cards' doppelganger? In 2007, the conflict was brought out in the open when not only the country's leading media, but also the heads of the departments themselves, started talking about a "feud” between the secret agencies. The FSO had clashes with both with the FSB (which did not end in favor of the latter), and the Presidential Property Management Department. The battle revolved around the property of the state – the Property Management Department was in charge of sanatoriums, construction and transport organizations, and the federal government's food plants, as well as foreign property of the state and dozens of development projects. Ultimately it was "Putin's guards" who prevailed in this “battle of the security forces.” According to the Unified State Register, the Russian news service RBK writes, no single presidential residence is managed today by the Property Management Department, but is under the supervision of either the Russian Federation itself or the FSO. The FSO's countless assets also include the company Ateks, which is affiliated with the agency. The subsidiary was established on the orders of Murov in 2003 and is involved in the construction of federal facilities, as well as in charge of the state budget, distributing state contracts and placing tenders for millions and billions (for example, for the restoration of the walls and towers of the Kremlin, Lenin's Mausoleum, or the Tchaikovsky Conservatory). But billions are not all. The FSO as a special service is almost omnipotent – indeed, its people have the right to carry out operational and investigative activities, conduct wiretapping and open correspondence, detain citizens, search homes and confiscate cars. While protecting state agency buildings and other sensitive sites, the FSO officers, of course, are also responsible for routes to the facilities. They have control of every 12th street in Moscow, and traditionally keep dossiers on those who happened to live there. Along the way, the FSO is engaged in sociological research projects. Closed ones, of course. This data is collected for the country's leadership, and it is believed that it is their reports that the president, the Security Council and the government rely on to make decisions. The agency prepares rankings of party and opposition leaders and monitors the socio-economic situation in the regions. If one of the governors resigns due to a loss of confidence in their abilities, the chances are that the FSO have provided some assistance in the matter. One of the recent extensions of the FSO’s powers is the creation and development of the internet's Russian segment for public servants. These people will also be in charge for encrypted communication channels.